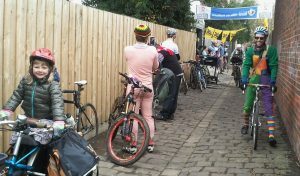 Melburn Roobaix is furthest thing from a race, in distance, speed or spirit. While the cobbles feature heavily, and the ride also concludes in a velodrome, this is a day to rekindle the wonder of your youth spent exploring the neighbourhood, hanging out with friends, making new ones and discovering a part of the city you never knew existed. Dress up, ride whatever you like, the wilder the better with prizes awarded to the ‘cutest couple’ and the ‘most awesome foursome’. Other prizes to be won are for ‘craziest contraption’, ‘dirtiest rider’ and ‘Spirit of Roobaix’ – you can even ‘Win your weight in Beer’ thanks to Temple Brewing.